Tuesday I talked about the bubble mask I bought at TonyMoly, and mentioned how I’m such a sucker for good packaging. Oh man, a novelty package gets me every time. And if the product it holds is also something I’m prone to purchasing? Well then just take all my money, because I’m in. TonyMoly got me with the bubble mask, and then they hit me again with my other weakness: Brow products. TonyMoly’s Inked Coloring Brows comes in a fountain pen. Well, it looks like a fountain pen. It’s just a tube of gel brow mascara you apply with a spoolie brush. But TonyMoly really sells the fountain pen look. It even comes in a box like an actual fancy fountain pen. The brow mascara itself is great, but with a few minor caveats. First the great things about it: It delivers so much tint, it’s amazing. I really like to fill in my brows, and with many brow mascaras I have to put on coat after coat to build up the coverage I want. With Inked Brows, the payoff is virtually instantaneous. It saves time and effort, which is especially nice when you’re in a hurry but want to do your brows. Because of the fountain pen packaging, the handle of the brush is a little bit longer than any other brow mascaras I’ve tried. This is also good for me, as my grip isn’t always strong, and the larger the thing I’m holding the easier it is on my arthritic joints. The downsides to this product are really only downsides if you’re nit-picky… or blonde. As you might already know, TonyMoly is a Korean brand. Korean makeup is made for Koreans, so makeup wearers with skintones outside of Korean parameters are less likely to find makeup to suit them. This is typically only applicable to face makeup (foundation, concealer, etc) but in the case of brow products, it also applies. I have dark blonde hair, and blonde eyebrows. When I buy a brow product I always buy the “blonde” version, but in a Korean product, the is no blonde. There are shades of brown and black. I can wear TonyMoly’s Inked Brows in the lightest color, light brown, but it is a little bit darker than I usually go. Still, it looks okay, especially because lighter hair with dark brows is A Look. The brows blend in better on camera than in person (so maybe this is a positive rather than a negative), but I’d say the shade is a bit more orangey as opposed to the ashy shades that I’m used to. The brush is also a little longer than I think is ideal. But on the other hand, it does allow for a faster application time. 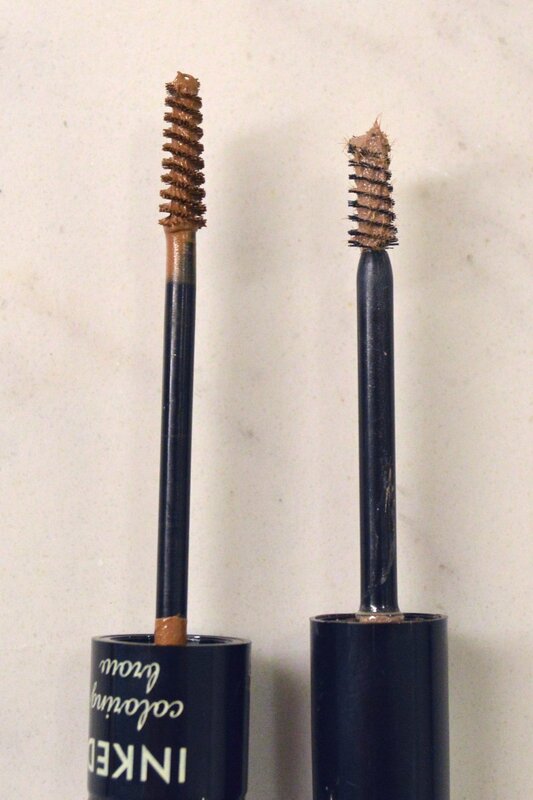 One of my all time favorite brow mascaras is Essence Make Me Brow (read a review here), and that brush is perfectly sized. I have to do a little maneuvering with the TonyMoly brush, and I haven’t yet applied it and not had to wipe off a little product that gets outside the lines. TonyMoly on the left, Essence on the right. Also you can see what I mean about blonde shades being more ashy. Overall, despite my minor complaints, I really love this brow mascara. I’ve been reaching for it over and over. It’s got everything I love, from a novelty package to a product that will polish up my brows. Excellent. Sep 11 Tattoo Your Eyebrows, Temporarily.